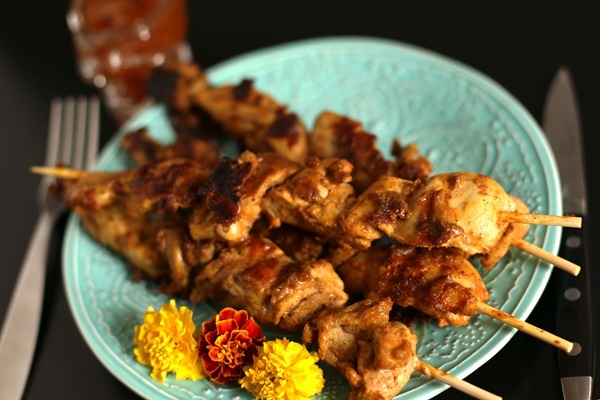 Something about the simplicity and spice mix of these chicken skewers by David Groveman at Life Without Six intrigued all of our testers. Fortunately, the amazing dairy-free yogurt marinade actually exceeded our expectations. Mix the cultured coconut milk and seasonings and mix with chicken so that all of the meat is coated. Place in a sealed container and marinate in the refrigerator for at least six hours. Prior to cooking be sure to soak the bamboo skewers. Skewer the chicken evenly and lay across the pan. Turn the meat every couple minutes until the chicken is cooked through. Allow the meat to cool for several minutes before serving. We served this with mango chutney for dipping.